FIXYOURTHINKING.COM / Need a brain? Borrow mine! : Brilliant! I just read about this "iPhone" concept for an Apple cellphone and found it to be brilliant ... in fact ... if I was a betting man (which I'm not, but let's say I am for purpose of this post) ... 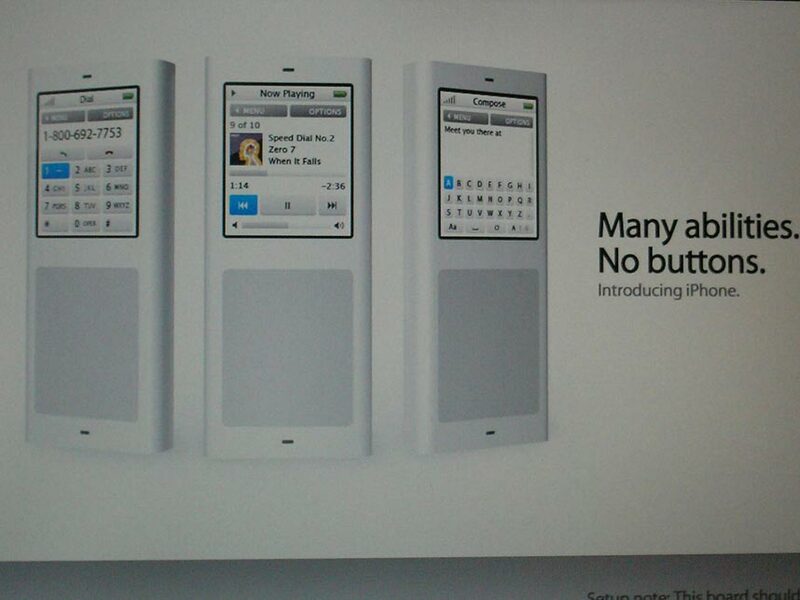 I would say this IS the ACTUAL phone. 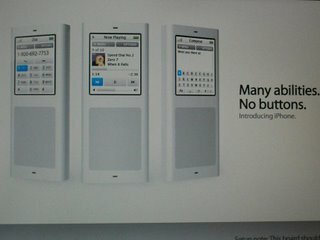 The author of this Slashphone blog post indicated that this may be an actual storyboard / ad concept design because of the warning in the right corner. (Click on the pic for more detail) If I were to speculate about the rest of this wording ... I would venture to say it completes like a Mission Impossible assignment - to destroy immediately following the presentation. I suppose the only argument not supporting this theory is that Apple most likely would have asked for the images to be taken down if they were actual images and the people within this presentation room (which I imagine were a very elite handful) would all be suspect and their job at stake. However, if you take the time to explore this concept, it is nothing short of genius on Apple's part (if true and I think it is) ... imagine just drawing numbers with your finger on the bottom trackpad, then just spelling out the contacts name. Now imagine how cool it would be to search for a song by the first letter by just forming the letter on the trackpad? Now imagine this as a bluetooth device and being interactive as an input device on a computer as a wireless bluetooth trackpad. My biggest pet peeve about candy bar telephones is that you push buttons inadvertently ... this concept solves that problem as well. This just appears so very clearly as something Apple engineers thought about. Out of all the speculation thus far, and from my own personal knowledge of the phone and its existence ... this has been the most plausible and most realistic rumor speculation to come out yet. * Although the name iPhone is now taken for a communications device ... the name iPhone remains the codename/accepted rumor name for Apple's iPod Cellphone. Err. Didn't Linksys release the iPhone on Monday? Also, isn't the iPhone name registered to Linksys? iPhone is still the concept name ... just as iTV is taken but is the current codename for the iTV DVR Apple plans to release. Apple owns the trademark iPhone in other countries. Apple also owns the domain iPhone.org. I agree, calling it anything else at this point is confusing. It is widely accepted to call the rumored phone, iPhone.